As we turned the calendar into January 2015, I was preparing for surgery, albeit confident. I was confident that this surgery would be the final surgery that I would need in this seven-year battle to rid the beast once and for all. As I went in for my MRI this past Friday almost a year later, I wondered about my scans and the status of my brain. Had you told me at the start of 2015 that my follow-up scans would reveal that my brain was completely clear with no residual tumor and normal in appearance, I would’ve called you an eternal optimist. YES! At that moment, I learned that my brain looked “as normal” as it can look, given all that it has gone through. Of course, me being the fanatic of the human brain that I have become, I asked to see the scans. He showed me several images, many of which were what he described as “normal” and unremarkable. This was, for all intents and purposes, the first time we have seen my brain that looked like one you would see in a health book of healthy, human brain. Let’s not mention the void of empty space where he said he had to remove a vein. But hey, I’m functioning, right?! As he delivered this news, I realized that moment was the beginning of my “new normal”. I was so excited and relieved to hear this news. I prepared myself to hear that “while everything looks great, we want to watch this spot or that spot…”, or “we’ll continue to monitor this piece over here which we can radiate, if needed.” But no, none of that happened. So where do I go from here? I’ll go back to Yale in six months for a follow-up scan, and then, if all goes well, we’ll try to push it to a year! Wow, to think that I’d be so excited that seven years out, I’m excited to finally get to scans once-per-year is a crazy thought, but it’s one I gladly accept. Receiving this news gives me the opportunity for the first time in a very long time to focus on other things that exclude my tumor and health. I can focus on my family, myself and my career goals and getting to the point of where I’m comfortable in my life and have some grander opportunities down the road. I will continue to raise money and be an advocate for this cause that I care so deeply for. The possibilities are endless, but for sure, I will not have to worry about my brain tumor for a while. 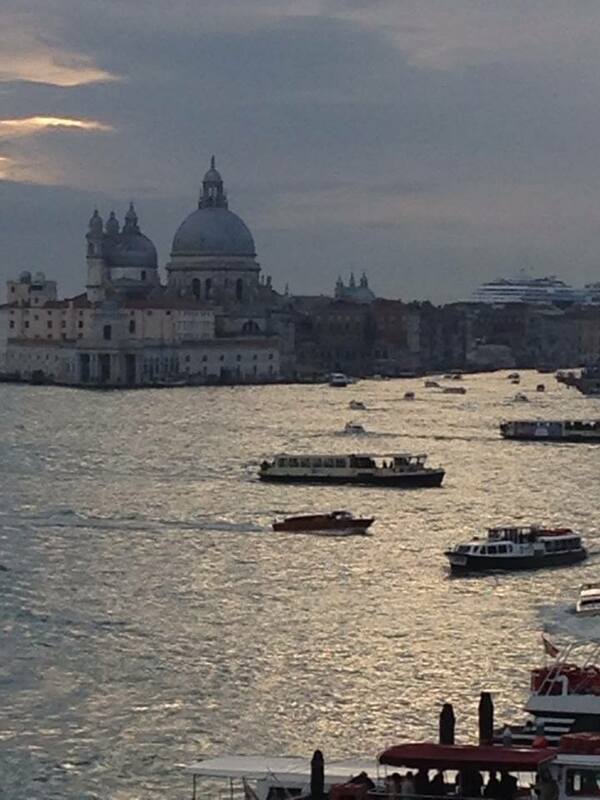 I can even look forward to going back here! Amazingly though, as I sit here seven years later, I can say with absolute certainty, the answer to that question is a profound “yes!” At the time I was diagnosed in 2008, I was 24 years old and left wondering whether I would even make it through the surgery, never mind what my future would have in store. Through the multiple ups and downs that I have faced since that day, I am standing prouder and taller than ever. I have found my calling. What I failed to realize in 2008 is how my diagnosis would change my life, and the lives of those around me, namely my family. Yesterday, along with my wife and family, we went to Yale-New Haven Hospital and presented a check in the amount of $13,500.00. Dr. Joseph Piepmeier with my brother Stephen and I. Without each and every person who supported this event, attended the concert, donated to the fund or donated merchandise for our raffle, yesterday’s presentation of the check would not have been possible. Because of you, we are providing hope to patients and their families dealing with this diagnosis. 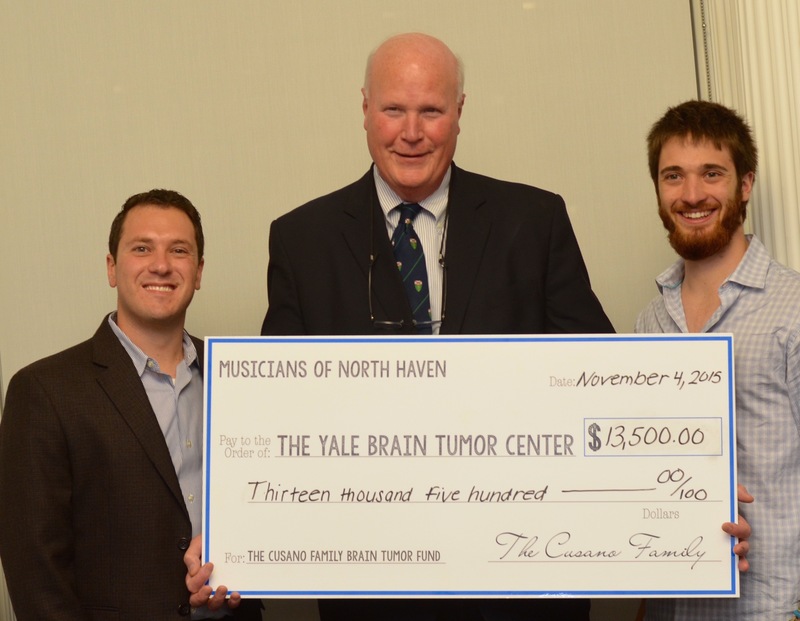 With these monies, Dr. Piepmeier and researchers at Yale spoke of hope and possibility to better treat brain tumors. He discussed his hope to develop a virus to destroy the tumor cells that can be injected directly into the tumor but while not harming the brain. To think that this money can deliver those results brings a smile to my face, and should certainly bring one to yours also. First and foremost, I thank Ashley and my family for supporting me in this quest and continuing to be there by my side every step of the way. Without you, none of this would be possible. Next, a giant thank you to our sponsors. Without your support, this would have never been possible. I am humbled by your generosity and compassion. I want to make a special mention to the “Rock Stars”, our corporate sponsors Carla’s Pasta and ShelfSpace Marketing, LLC. THANK YOU! I would be remiss to not mention each company who donated a raffle item – J. Christian’s, Omar Coffee Co., Arnold’s Jewelers, Libero Jewelers, The Max Restaurant Group, The University of Connecticut, Ted’s Auto, Precision Concepts and The Walter Camp Football Foundation. The raffle raised about $2,500 of the $13,500. Thank you for your support, dedication to this event and desire to assist in this quest. Your generosity alone merits the grandest of recognition and I hope that you can feel the pride of knowing that you contributed in such a great way. To the bands, Broca’s Area and Goodnight Blue Moon – absolutely amazing. You entertained the crowd all night long and gave all of us, brain tumor patients included, a reason to smile and forget about life for a while. As I mentioned in an earlier blog post, you made the night the success that it was. I am thrilled to tell you that next year, we’re taking the concert to the Stoney Creek Brewery in Branford. We tested the waters and now know that this event could be the success that we originally envisioned.